Ultima Hairball Control – Turkey and Rice was developed together with veterinarian experts at Affinity. Cats spend a lot of time grooming themselves, using their rough tongue like a brush to remove loose hair and dirt. The loose hairs are often swallowed and paΒ with difficulty through the cat's digestive tract, sometimes causing digestive iΒues or hairballs that the cat brings up. Ultima Cat Hairball contains special natural fibres and malt extract which help to facilitate the expulsion of hairballs. The fibre also helps to prevent further hairballs from forming as well as easing the paΒage of hair through your cat's digestive tract. Wholegrains also help to keep the digestion balanced. 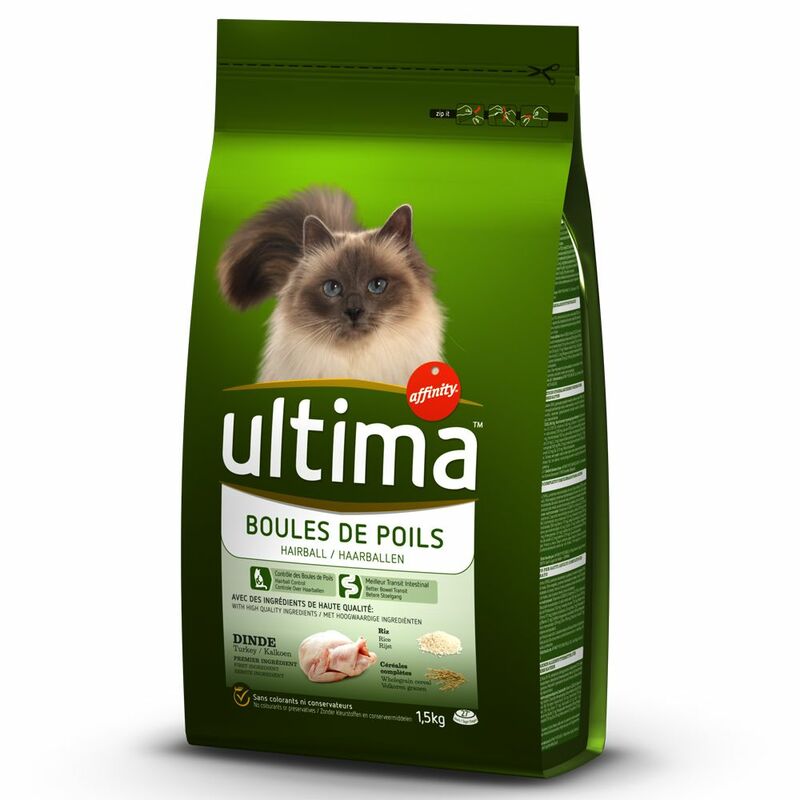 Ultima is a highly nutritious cat food packed full of antioxidants, vitamins and minerals, all of which help your cat's immune system to stay healthy and keep your cat on top form. Turkey is the main source of proteins, to help maintain healthy muscle. As with all Ultima products, only the best ingredients are used, under strict quality controls. The product is gently steam cooked to preserve the natural nutrients and flavours of the original ingredients, then it is packaged in resealable pouches, to keep the kibble fresh for a long time after the pack is first opened. Affinity Ultima Hairball Control – Turkey and Rice at a glance: Complete dry food for adult cats Hairball Control: Natural fibres, insoluble fibre and malt extract to prevent hairballs from forming and to ease the paΒage of hair through the digestive system Balanced nutrition: ideal combination of proteins, vitamins and minerals With turkey: high quality source of protein, to help maintain healthy muscle tone With whole grains: as a source of good carbohydrate and to help regulate digestion With taurine: to support cognitive function, eyesight and nerves Gently steam cooked: to preserve nutrients and flavour High standards of food safety: strictly controlled manufacturing proceΒes with high standards Resealable pouch: for freshneΒ Tasty kibble: oven-dried No colourings or preservatives.